According to Wiktionary, a bench grinder is a type of workbench-mounted grinder that has two grinding wheels located at the ends of the motor shaft. It is typically used to hand grind different cutting tools. Since its wheels are essential, we will be discussing how to change bench grinder wheels and get to know the origins of the grinding wheels. Cousins Franklin Norton and Frederick Hancock opened a pottery business in 1858 and were mainly focused on redware and stoneware pottery. Eventually, they expanded to manufacturing items like jugs, spittoons, and beer bottles. In 1873, one of their employees, Sven Pulson, invented the kiln-fired grinding wheel that was shaped using a mixture of water, clay, emery powder. Frank Norton patented his employee’s invention and began reproducing it. Pulson’s concept was revolutionary and surpassed industry standards. Such wheels eroded as they were used resulting in a fresh cutting surface every time it was used. It was also cheap and efficient because it was manufactured rather than quarried. So, in the late 1880’s, the grinding wheel became an essential tool in every machine shop. However, in the 1890’s the emery wheel was overshadowed by aluminum oxide and silicon carbide composites. The emery wheel is still in use but more for polishing than grinding and shaping. Through the years, grinding wheels made from different materials were created and patented. 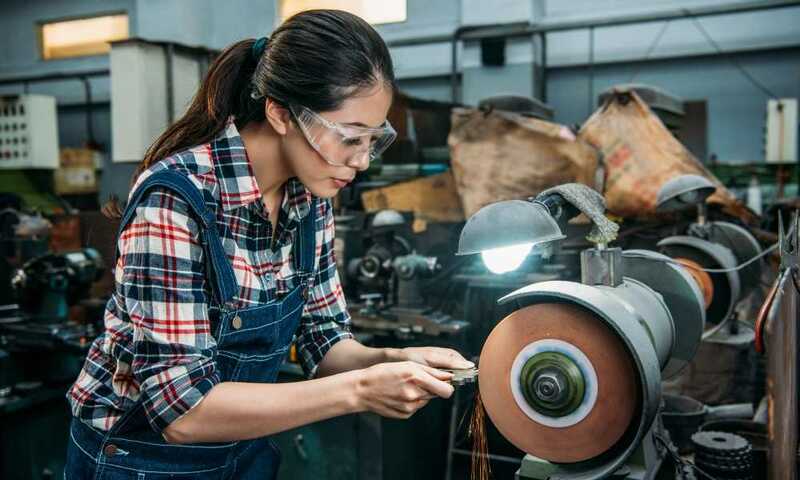 Before changing the bench grinder wheel, it is important to wear safety glasses. You should also make sure not to exceed the recommended torque level in tightening the bolt when securing the wheel. That is because such can lead to the possibility of the wheel coming off while you are using it. In addition, make sure that the replacement wheel has the correct size and speed rating for your speed grinder. Ensure that the bench grinder is unplugged from the main source. The backup power source should also be switched off in case it is connected to such. Likewise, if it’s possible to remove the power lead, go ahead and do so to prevent any obstruction. Even if you already know how to use your bench grinder, it is still important to do a quick study of the tool that you will need to accomplish the task at hand easier. Therefore; examine your bench grinder to find out how it works and which part needs replacement. You can also check out the instruction manual once again because this should outline the full details on how you can safely detach and replace the wheel. Most bench grinders feature a safety guard which needs to be taken off so you can remove the wheel quickly. To do this, you need to find the screws that help attach it to the main body of the machine. Then, carefully remove them using the proper screwdriver. After that, take off the safety guard completely instead of twisting it out of the way. Determine where the drive shaft of the bench grinder is, and with the use of a wrench, unscrew the nut and washer that anchors the wheel. Set them aside and make sure you don’t lose them. If it is stiff, apply a small amount of oil on the joint of the shaft and nut. Then, remove the wheel carefully but make sure you are wearing some gloves to protect your hand. Place the new wheel the same way that the old one was positioned. You may need to make sure that you place the wheel the right way depending on the type of wheel you are mounting. Like the previous wheel, slide the new one to the furthermost point that it can reach, and then, put the washer and nut. Using a wrench, the nut should be tightened back into place.One important note is not to put too much force during tightening because this will naturally tighten when the wheel is in motion. Test the new wheel by turning on the machine and watching the wheel turn. While doing such, listen for any unusual sound or movement. If you notice something different, like a wobble or noise, turn off the machine from the mains first before correcting the issue. Finally, if you see that it is already working properly, turn off the machine and place the safety guard again. The bench grinder is one of the most important tools to have in a workshop because it can do a variety of things like sharpening dull tools, fixing broken blades and polishing and repairing small pieces of steel. However, like all machines, some parts of the bench grinder need replacement, such as its wheel. This is imperative so that it can always do the things it was made to do correctly. Furthermore, this is part of the machine’s maintenance as well. You may hire someone to do this for you but being the handyman that you are, this is something that you will be able to do on your own. Also, the steps on how to change bench grinder wheel, which is enumerated in this article, are simple and very easy to follow. You don’t need to be an expert to be able to do it. The procedure also includes safety precautions so that you can prevent injuries while you are in the process of replacing the grinder wheel. In addition, it has the things that you will need so you can do each step easily. Finally, changing your own bench grinder wheel can be a satisfying endeavour. Therefore; doing it properly and safely is imperative.